Baroness just dropped a big tour announcement with tons of dates all across their homeland for spring of next year. They’ve been around for quite some time (fifteen years by now), and they’ve garnered quite some attention with their unique sound, especially among the big names they’ve toured with. Last year, Baroness have announced that they’re writing new material, so it’s safe to assume we’ll be hearing some of that on this tour. Supporting them we first have Deafheaven, a band that needs no further introduction at this point. Having reached a massive following and great acclaim after the release of their sophomore effort Sunbather, they have just released Ordinary Corrupt Human Love this summer, which is their fourth full-length. We are most definitely going to be in for a treat right there. Last but not least we have Zeal & Ardor,an up-and-coming band that likes to stretch the boundaries of genre tags, much like the people they’ll be touring with, but in their own unique way of course. They have also released a new album titled Stranger Fruit this year. Whoever makes it to these shows is in for a lot of fresh music! 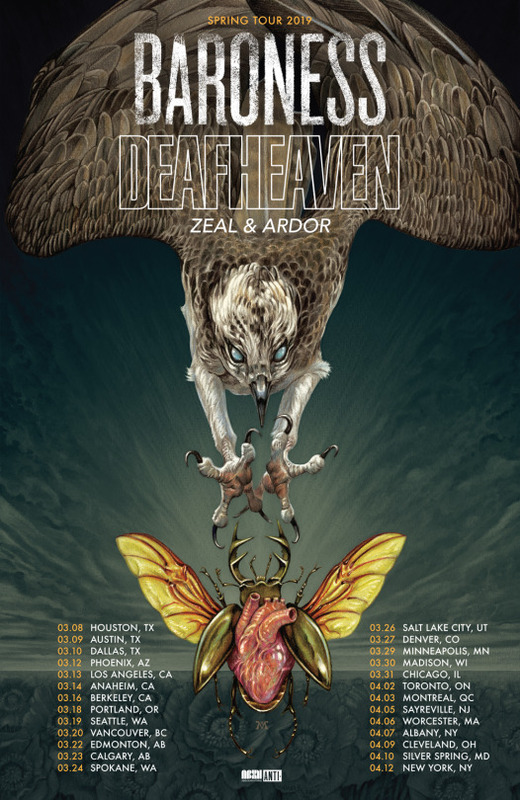 Be sure to follow Baroness, Deafheaven, and of course Zeal & Ardor. Previous PostAmerican Football Announce New Album with Beautiful Single "Silhouettes"
Next PostParius To Bring "The Eldritch Realm" To America's East Coast!